Help Quinn make wedding bells ring! 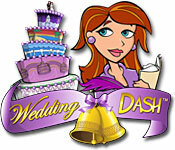 Featuring the hilarious ups and downs of wedding day drama, Wedding Dash incorporates the plate-spinning fun from the Diner Dash ® series with the added challenge of pulling off the perfect wedding reception. Can you keep the bride and groom happy and Quinns business afloat? You have to visit the seven continents, get more then 120 levels in the story mode, solving logical puzzles. Travel back to the 18th century and uncover the secrets of bygone days with Golden Trails 2: The Lost Legacy!